• Mini size with sleek design. • Be able to connect all of the Sky digital receiver (Digibox) come up with a second output. 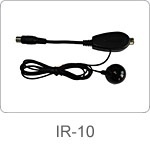 • Can also be connected to a multi-point distribution system when connected to a suitable amplifier and network.